Live chat is all the rage these days on websites. I used it on Credo for a number of months and decided to remove it completely from the site. But I think live chat is a valid solution to a valid problem for the right companies. The most popular live chat solutions are Intercom and Drift, but there are a few new entrants like Sumo who are starting to make some noise as well. Intercom and Drift are of course much more than live chat because they offer different marketing automation options, but they are primarily recognized because of their live chat capabilities. I’ve paid for both for a number of months, but I completely stopped using them on Credo in December of 2017. Now, remember that Credo is a lead generation site but we are a tech company as well. Vetted agencies pay us to send them introductions to new potential clients, and businesses looking for advice as well as help finding the right agency can pay us to consult with them and manage them through the finding process. I’ve found that live chat does not work for Credo and actually may have worked against us. Here’s why it didn’t work for Credo, but why I think it it probably a good idea for SaaS businesses. Live chat connotes one thing – “get your questions answered right now”. That’s great for a company that has a support team and tens of thousands of users who have questions, but not for a small company like mine where everyone wears multiple hats. With live chat, your potential customers can ask you questions before they sign up to buy or submit a form. Both Drift and Intercom then allow you to email from within their system and move back and forth between chat and email, and even push them to schedule a sales call. On the tin, this sounds amazing right? You get to speak directly with your potential or existing customers and either move them in the direction of a sales call or provide support to them directly. But if you do not have a built-out sales team and need to focus on things that matter more to the longterm health of your company, live chat can be at best a hassle and at worst something that works against you if you are not responding to them in a timely manner or at all. After all, it’s live chat and they expect you to be there. Target the countries in which your chat box is shown. Being in the SEO world, I had a big problem with people overseas trying to chat us at 2am Denver time to ask for SEO advice. I was asleep, and the purpose of the chat was to help them find someone to work with, not to get free advice. On the mobile front, I can absolutely see the use case for a mobile app and I used it pretty often. I had a few experiences that made me realize that live chat was not working for my site, the most obvious being when I was in Switzerland traveling (and off for the day) and hadn’t set the chat not to show. I was literally getting into my friend’s car during a snowstorm in a small town in Switzerland when someone wanted to chat with me at 3pm their time on a Friday. They said they needed help right then and there. I quite simply told them I was not available right then (it was 7pm in Europe) and they should schedule a call. They were annoyed and never scheduled a call. I removed live chat that night. If you’re considering live chat for your SaaS site, you need to think about your sales cycles and what makes the most sense for your client. If you are selling $29/mo proposal software, live chat might make sense if they have a quick question before converting. But if you’re selling a $299/mo or higher product, live chat might add extra friction that will just result in them scheduling a call with you as well. My fear is that many SaaS companies are relying on non-scaleable “live” chat to try to set up sales calls instead of building out conversion-oriented content in a way that scales, drives traffic, and ultimately leads to more conversion. I see a lot of SaaS businesses these days investing in support teams to handle their live chat or email volume, but they are not building out resources to help their users solve their own problems! Remember the saying “Give a man a fish and he’ll eat for a day, teach a man to fish and he’ll eat for a year”? If you are using live chat and email as your means of support, you are always going to be reactive in your business and probably have to hire more and more people to handle the volume as you grow. If you don’t hire more people, then your reply times will get much longer and you’ll have annoyed customers. Instead, I say you should absolutely be speaking with your customers via email but then taking the knowledge that is locked up within those email chains and publishing that content somewhere on your site where you can repeatedly point users who have the same problem. As I mentioned at the top, I can see live chat working very well for converting customers to a lower priced SaaS tool up to around $49 a month. Above that, your customer lifetime value begins to get bigger and the sales cycle becomes longer. They need a person to go to for help, not a live chat box. If they are considering spending potentially thousands of dollars per year with you, then you need to get them on the phone and speak with them to build that trust, answer their specific questions, and move them towards the close. I realized that since Credo doesn’t target lower-budget projects (we refer those out to a marketplace that we have partnered with), live chat didn’t work as only those who have lower budgets were actually using it. We also used to offer live chat as a way of vetting out a project once you submit your information through our form. But once again, it was only during specific hours and it was not nearly as effective in getting the information that we needed as voice. So I removed it from the site and push everyone to schedule a call. As Dan Martell says, “one channel and one offering”. On Credo, that’s to schedule a call. Before you implement live chat onto your site, you need to determine the purpose it will serve and the problem it is solving. Think about it this way. If you have a SaaS company that’s doing $1,000,000+ ARR per year, did you start by saying “I want to build a SaaS company”? No!. This is what you’ll see on /r/entrepreneur and other cess pits of the internet, the “I want to build a SaaS but I don’t know where to start” people. Same with live chat, or email marketing, or SEO. You don’t just do it to do it, because others are doing it. If you do you may get lucky sometimes and it will work, but usually it’ll fail to make a material difference in your business because you weren’t strategic in what you were spending your time on. If you run into challenges in growing your business, like you don’t know why people aren’t signing up or you don’t know what their objections are, then maybe live chat is right for you for a time. And if you sell a higher cost product, maybe you need those automatic followups and seamless ways of communicating across chat and email. Otherwise, maybe live chat isn’t right for you. Who do I recommend for live chat? 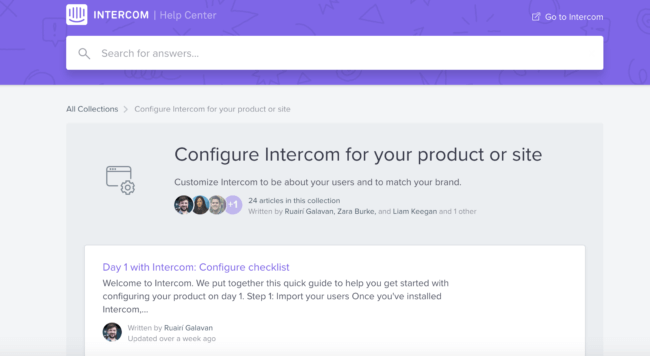 As I said at the top, the two main live chat (and marketing automation) products out there right now are Intercom (who is arguably the market leader) and Drift. I’ve used and paid for both. I moved from Intercom to Drift because I needed the easier ability to display custom messages and control display rules, and honestly I did not need Intercom’s email marketing automation because I already use MailChimp and HubSpot in my marketing stack. So Intercom was too powerful for me, and I had no reason to switch from what has been working. Support can be handled in better long term ways than live chat. Just like marketing and how you grow your business, live chat/support/marketing automation and the approaches you take to these depend on your type of business. I don’t think live chat works for Credo for lead generation right now. I’m glad we tried it, but for now it’s gone.